Tattooing has been a fashionable form of body art since time immemorial. These days, most people use tattoos to represent certain things in their lives and to make a fashion statement. 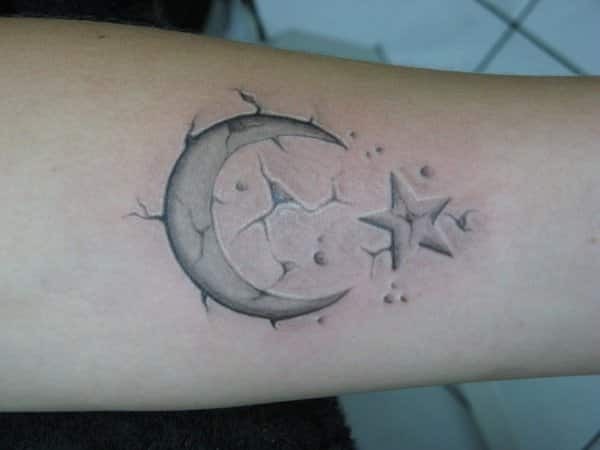 Sun and moon tattoos are some of the most popular tattoo designs. The sun and the moon have always been respected from the ancient times. There have been many different legends around the sun and the moon. Some designed them similar to God or gods and included mysterious forces in them. 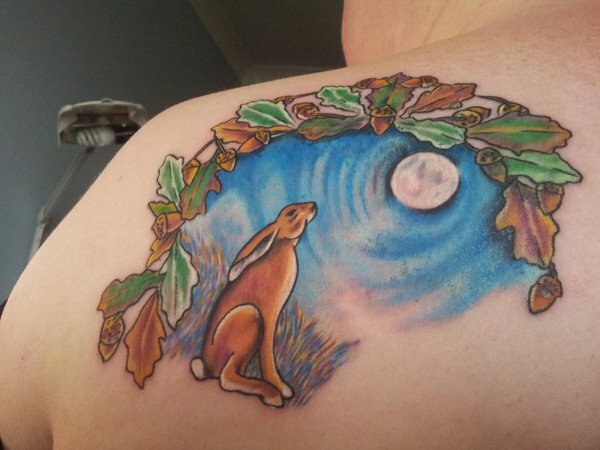 To lionize the sun and the moon, many people have had the sun and moon tattoos done on them. The sun and moon tattoos for men have become extremely popular because of the many meanings they hold. The sun represents energy and eternal life. The bearer of the tattoo believes that the sun brings good luck in everything they do. The sun and moon tattoos for guys are also known to signify the merger of opposites, collaboration and unity, instead of disagreements and conflict. For many people, just seeing sunrise is an exciting sight and combining the sun and the moon as a body art is highly satisfying. These days, the sun and moon tattoos for men can be seen in a range of designs, ranging from practical to fantasy, usually in styles that are similar to Yin Yang and done separate from each other, but close enough to bring out the intended meaning. The sun and moon tattoos are very attractive when done in the cartoon style. The sun can be inked smiling away at the heat he is generating while the moon can be done with a half face. 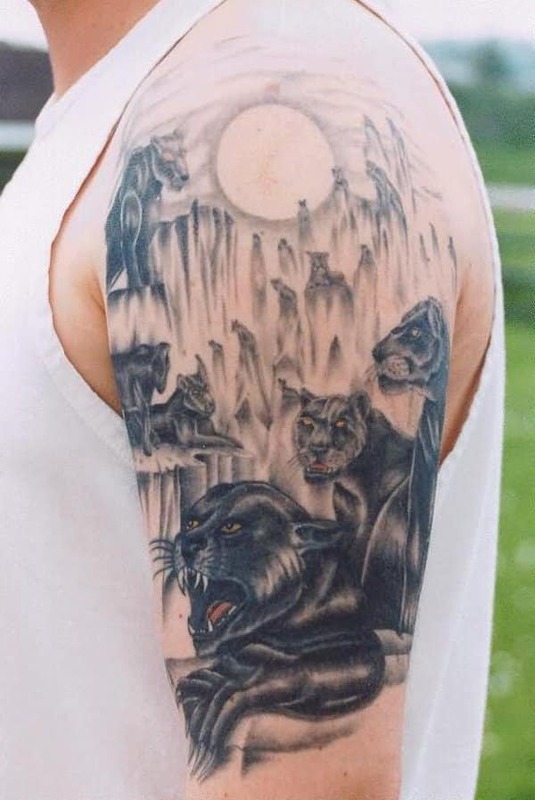 If you choose a fantasy design for your tattoo, you can do virtually anything you want, but make sure you use rarely seen colors for the moon and the sun. For instance, you may opt for a blue half moon and a green sun with some rays radiating so that people can easily recognize the symbolism. The merging of the sun and the moon in a tattoo is akin to that of the good and the bad or the yin and yang. As there are many references of the divinity of the sun in many ancient cultures, we also find many moon worshipers. The sun and moon tattoos represent the basic concept of life i.e. there are good things and there are also bad ones. Both these concepts appear concurrently in everyone’s life and everyone has his good and bad days. As the sun rises and sets each day, everyone has their good times and bad times in life. Many people also consider the combination of the sun and the moon to represent unity and the feeling of togetherness. Some people also believe that the merger of the sun and the moon represents love and wedlock. If you have decided to have the sun and moon tattoos for men, you have a range of designs to consider. You can either opt for the Celtic or the tribal designs. Be sure to do your research and choose the best colors for you and the message you want to convey. Also, make sure you work with an experienced tattoo artist who can help create the perfect sun and moon tattoo for you. A woman in a petite black dress sits by the bay while the winds blow her soft hair and the moon shines in the night sky. The scene is so realistic in this tattoo that you can almost breathe in the scent of the seas and enjoy the majestic view underneath the moonlight. If there’s a man in the moon, there must be a woman as well. 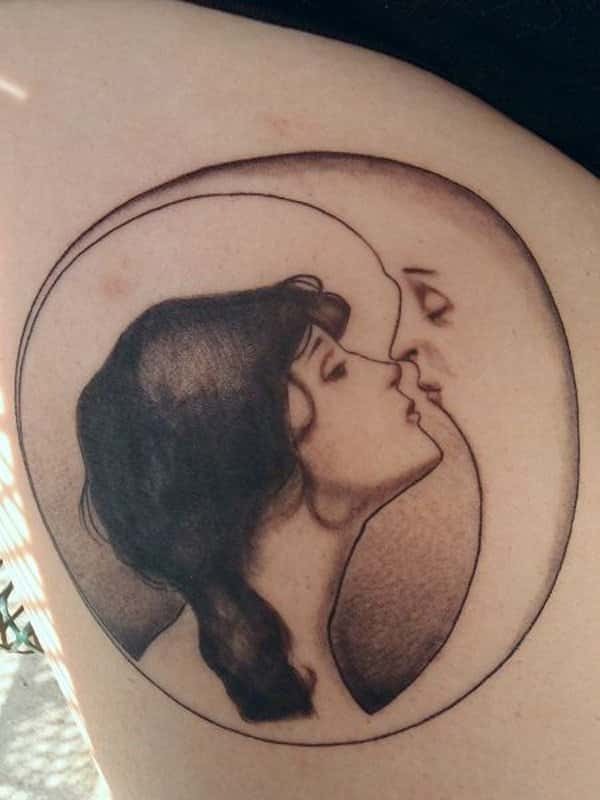 Thus, this fascinating moon tattoo ideas features a beautiful long-haired woman touching noses with the moon itself that’s bestowed a face. Its crescent shape extends beyond to form the circular frame around the lady and the mystery that binds them. A huge moon in crescent shape and a small star linger in space amidst tiny round objects floating about and various other unknown heavenly bodies. Cracks and lines elicit how fragile they can be, while their beauty manages to shine through as this unique tattoo appears embedded in the skin. A crescent moon rests at the center of the wrist, where it dangles a little star straight from its tip. The heavenly body cradles a warped or apparently melting clock with the numbers and hands still visible, with its softened form adding admirable subtleness and elegance to the entire tattoo. 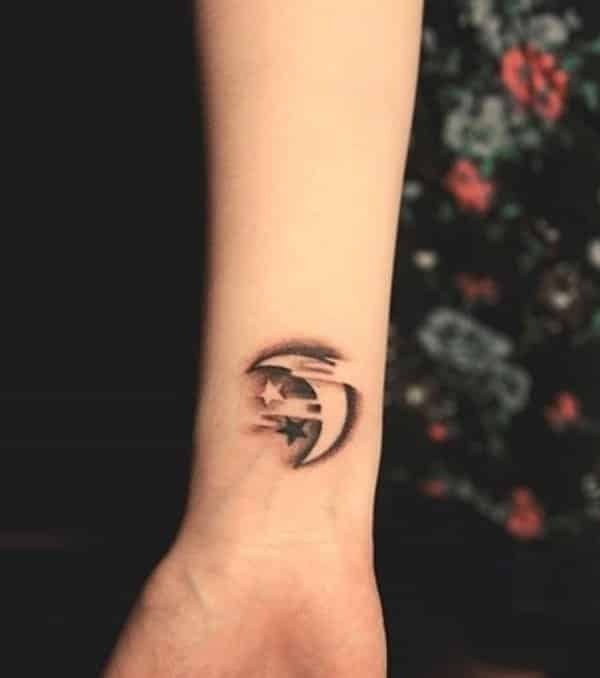 This moon tattoos for guys features two little stars in contrasting hues, one arrives in brilliant black while the other in elegant white, perfectly matching the moon right beside it. The heavenly objects float in the darkness and black shadows, where white mists of clouds slowly and softly pass by. Cool, bold, and dauntless. 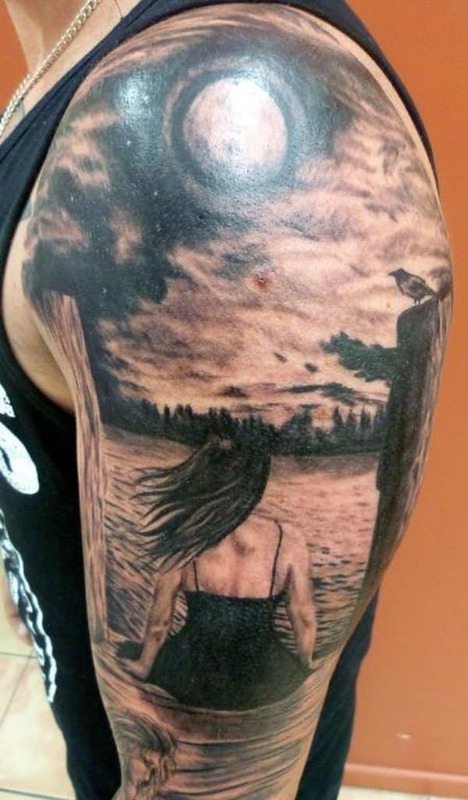 This striking tattoo masterpiece gives off unsurpassable strength with the image it represents. Countless black creatures of the night with sharp fangs, gritted teeth, pointed claws, and bright yellow eyes sprout out of the woods and mountains. They gather around underneath the light of a huge full moon. One of the most amazing sleeve tattoos ideas that exhibits a work of art! This image shows a little girl wearing an adorable flower headdress sitting under a lifeless tree. The glow of the big yellow moon provides a faint light and you can see birds resting on its branches that do not have a single leaf. 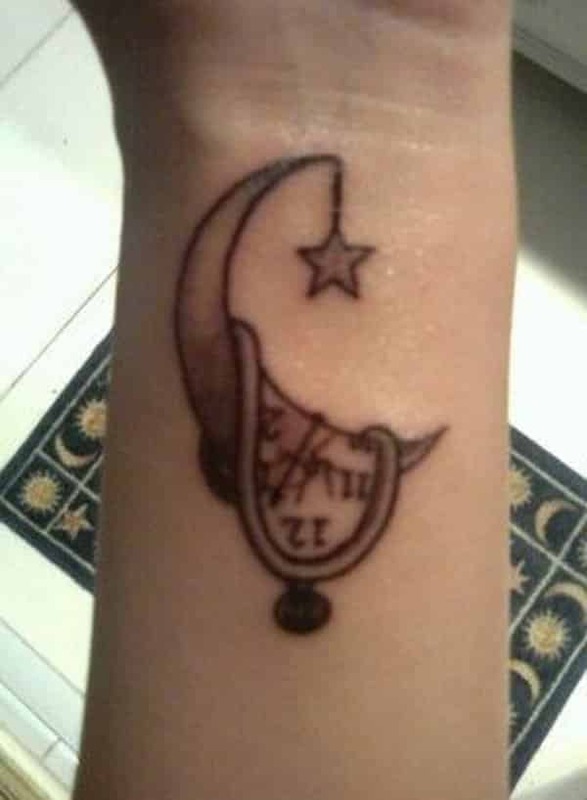 This crescent moon tattoo design has a lamp hanging at the tip, while some ropes are knotted at the end. 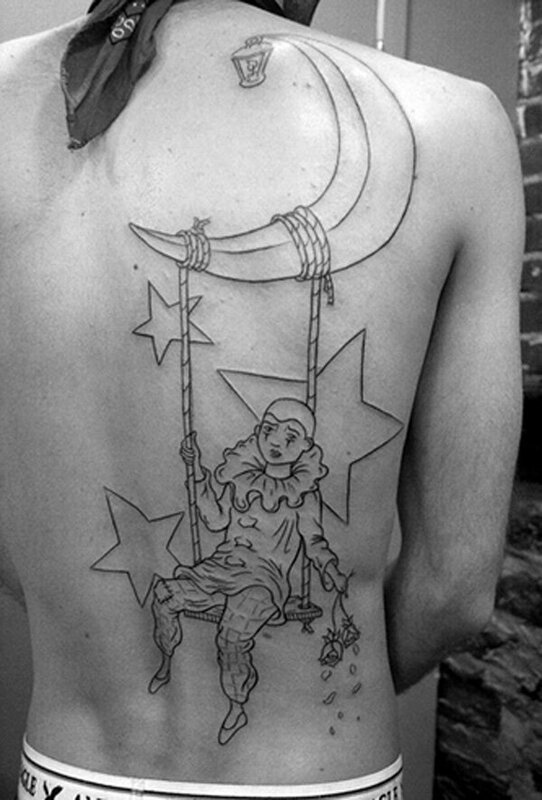 It dangles and carries a swing where a young boy wearing a clown costume and holding some roses in his hands plays along. The wooden swing is surrounded by small and big cartoony stars. 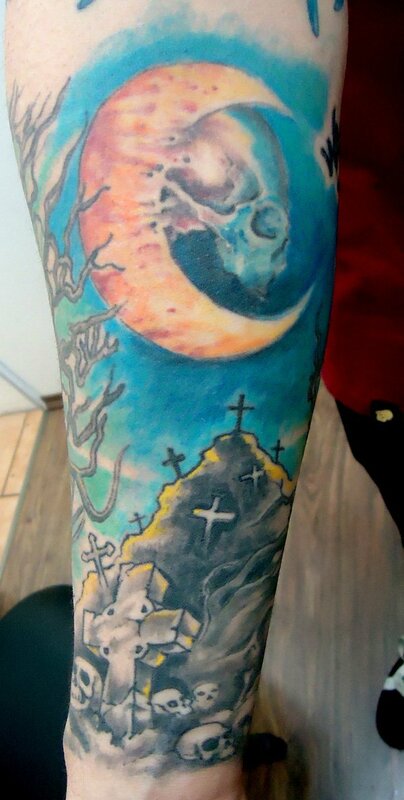 A splash of colors are blended into perfection in this alluring moon image tattoo. It shines in an eerie yellow orange light amidst a vibrant blue sky, right above a tall mound where a number of crosses stand. Bones and skulls are found at the bottom while dead branches line the side of the tattoo. Found at the top left shoulder is a queer and very fascinating image of the moon which seems to be warped in the blue sky. A large hare sits in the iridescent grass and gazes up at the beautiful scene surrounded by a wreath of golden and green leaves brimming with acorns.